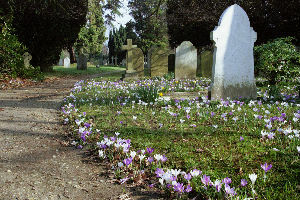 A team of volunteers meets normally (except where marked *) on the second Saturday of each month to work in the Churchyard. We trim trees, rake leaves, tidy graves and paths and have a good time doing it. We have a break during the morning to enjoy coffee and homemade cake. If you would like to join us for a morning of moderate exercise and lots of companionship, do please come - we would love to see you. We start at 10am and finish at 12 noon.